How to convert MPEG to MP3? Is there a MPEG to MP3 converter that can convert MPEG to MP3 without any quality loss? This article with a powerful free MPEG to MP3 converter will figure you out and offer you the operation guide. 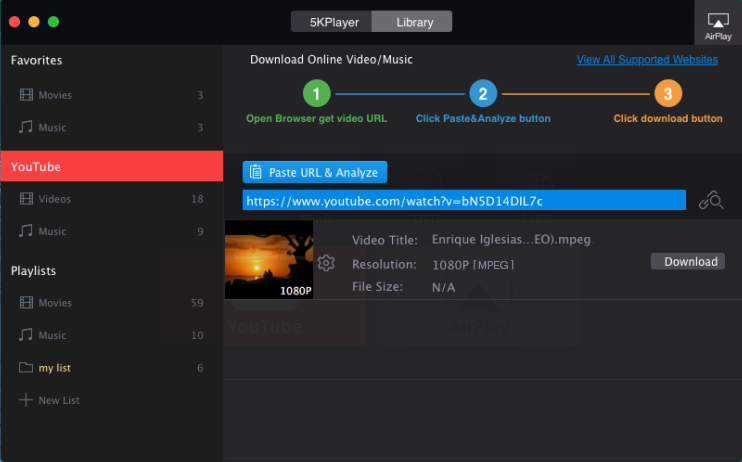 5KPlayer, as a free MPEG to MP3 converter, is totally free from malware, spyware with the features of user friendly interface and all pointing buttons with directive words which makes it very easy to comprehend to convert MPEG to MP3 and very safe to use. MPEG is a file format short for Moving Picture Experts Group. MPEG generally produces better quality video than competing formats, which is why MPEG file got so widely used for storing video and audio. MPEG files previously need hardware decoders for MPEG processing, and a tedious way to convert MPEG video to MP3. That's why you need a MPEG to MP3 converter. Imagine that you found an amazing soundtrack while you are watching a movie, a music video or you still didn't get enough of listening to a speech video. Do you want to change video format, like extract the audio file to the wide supportable MP3 format from the videos so that you can get to play it on your Smartphone like iPhone (SE/6s/6s Plus)/Android or portable MP3 player? Suppose the videos are in MPEG format, what can you do to convert MPEG to MP3? With 5KPlayer, the best free MPEG to MP3 converter installed on your Mac (OS X 10.11.4 and before)/(Windows 10 and before), you don't have to worry about how to convert MPEG to MP3 and anything like such! With this best free MPEG to MP3 converter 5KPlayer installed on your Mac or PC, you can use it freely to convert MPEG and extract audio from videos movies with fast speed and perfect quality. It not only converts MPEG to MP3, AVI to MP3, WMV to MP3, but also supports converting various video formats including MPEG4, MP4, MOV, 3GP, WEBM, etc. to popular audio formats such as MP3 and AAC. Step 1: Download, install and launch this free MPEG to MP3 converter, and then click "YouTube" button on the main panel. It will go to the download window and then you need to copy the URL of the .mpeg video on the website (check the site list that 5KPlayer supports) and paste to the address bar. When it is done analyzing, hit "download". Step 2: After successfully downloaded the MPEG file, you will find it in the "Videos" folder on the left. And then click the file icon below the target MPEG video you wanna convert. Select "MP3: Convert to MP3" from the appeared menu and the free MPEG to MP3 converter will do the rest. This free MPEG to MP3 converter only supports converting the MPEG files which are directly downloaded from YouTube or other video sites with itself. If you want to convert the MPEG files you saved before, check the additional converter to convert the downloaded MPEG to MP3. 5KPlayer has been updated regularly to ensure its best capacity in all functions which include: Play video and music in different level of definitions and almost all formats, stream media from one screen to another (iPhone/iPad to Mac, Mac to Apple TV, etc. ), and the most fabulous function - download online videos and convert directly to music formats! Free download this MPEG to MP3 converter on this site and give it a try! The best free MKV to MP3 converter is recommended to convert MKV to MP3 in this tutorial. How To Change Video Format? This best free video format converter can convert a 4 min video to MP3 AAC in 5 seconds.